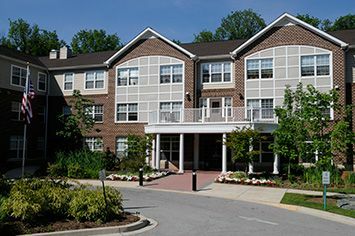 Built in 2005, Arlington Estates Co-op is a 3-story, 68 unit community for independent senior citizens who are 62 years or older. It is nationally recognized as “A Community of Quality” by the National Affordable Housing Management Association. Join the members of Arlington Estates Co-op for their weekly exercise class, some games on the Nintendo Wii or in front of the cozy fireplace in the lobby. Arlington members love to throw holiday parties and cookouts. When you’re not socializing or volunteering, you can relax in the privacy of your one bedroom apartment. Arlington Estates Co-op Apartments has become a healthier and safer environment to live in by becoming 100% smoke free. Smoking is not allowed within the individual apartments, the common areas and within 25 feet of the building. Arlington Estates Co-op is conveniently located near I-83 and I-695. It is nestled in a wooded area off of Northern Parkway directly across the street from the Northwest Plaza Shopping Center. Arlington Estates Co-op is affordable for everyone. Every unit has subsidy and resident members pay only 30% of their income for rent. So don’t wait! Call for tours! Join us today! Arlington Estates Co-op is proud to be recognized as a NAHMA Communities of Quality Corporate Partner. This designation is for multifamily properties that have achieved a high standard of excellence in the way they are managed, the services they provide residents, the experience and training of personnel, and other criteria.